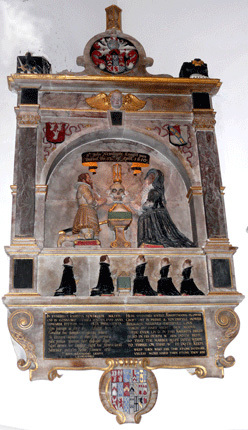 The monument of Sir John Newdigate at Harefield, Middlesex, takes a common form for a mural monument of the period, that of husband and wife kneeling under a plain round arch, facing each other over a prayer desk, their children kneeling below, two sons facing three daughters with a prayer desk between them. The spandrels of the arch have the arms of Newdigate and Fitton on hanging shields with loops of ribbons around them. Above the keystone is a cherub head with wings either side and the tablet is surmounted by an achievement of nine quarters in a roundel topped by an hourglass. The materials from which the monument is made are also common for the period, mostly alabaster but enhanced with imported black and pink marble. Some parts, however, are a little less usual. 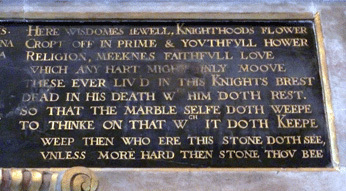 Sir John’s name and date of burial, 12 April 1610, are on a scroll rather than part of the main inscription. The scroll is set over the two main figures and below it, above the prayer desk, is a winged skull with a second hourglass set on it. At either end of the cornice are black marble blocks, on the front faces of which are crests. These blocks presumably once had obelisks standing on them but they are rather larger than is necessary just for that purpose. The tablet’s apron, on which is the inscription panel is terminated at either side by large S-shaped foliate scrolls and has strapwork along its lower edge. Depending from it is a shield with twenty-two quarters on it, set on an an oval with a lower termination of strapwork, which looks forward to similar features on mid C17 monuments. So, while the monument is in many ways typical of its time, it is also distinctive in others. 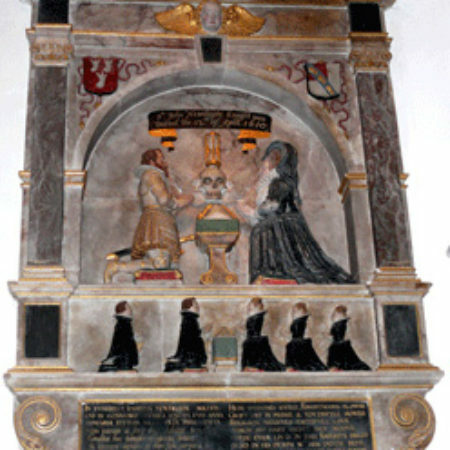 The monument was erected by Ann Fitton, Sir John’s widow, whose agreement with the sculptor William White was recorded by Lady Anne Emily Garnier Newdigate-Newdegate in her 1897 book, Gossip from a muniment-room: being passages in the lives of Anne and Mary Fitton, 1574 to 1618. Unfortunately Lady Newdigate-Newdegate gave very few details other than the date of the agreement, 1614, and that it was on parchment. Its current whereabouts are unknown. William White is equally unknown but was undoubtedly a very competent London sculptor. Dead in his death wth him doth rest. Unless more hard then Stone thou bee. 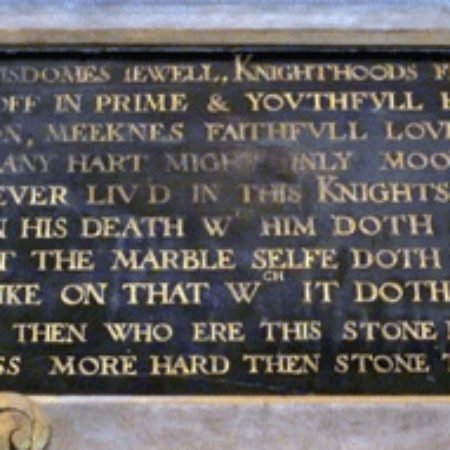 Two earlier monuments have closely related verse epitaphs. That to Sir Martin Culpeper, died 1604, at Feckenham, Worcestershire, both begins and ends with the final couplet of the Harefield version and omits the couplet before that, while the epitaph of Mary Plomer, died 1605, at Radwell, is adapted to suit her (Vertues Jewel, Beauties Flower) and omits the third couplet of the Harefield version. While it is possible that these verses were ones that occur only on monuments by William White, comparisons between these three monuments are rendered difficult by the dismemberment of the Feckenham example – the effigies are said to be buried beneath the church floor – and the very different form of Mary Plomer’s standing wall monument – she is seated holding a dead baby (and an hourglass!). Her six sons and five daughters are arranged in the same way as those at Harefield.but don’t appear to be by the same hand. The phenomenon of marble weeping, as the epitaphs at Harefield, Radwell and a number of others mention, is one that I have seen myself only once. On a visit to St Peter’s church, North Barningham, Norfolk, I found all the black marble components of three monuments of the first half of the C17 in were absolutely covered with drops of water.